The demand within the global market for auto-injectors is projected to trace an upward graph over the forthcoming years, predicts Transparency Market Research (TMR). The market players in the global market for auto-injectors have been introducing new and innovative strategies in order to establish their supremacy on global landscape. While the leading players making new leaps in business by manufacturing advanced products for drug injection, the smaller market players are focusing on effective pricing and product positioning. The presence of multitudes of small, medium, and large-scale vendors gives a mark of fragmentation to the global market for auto-injectors. Mergers and acquisitions are anticipated to be the most sought after strategies of the vendors operating in the global market for auto-injectors. While mergers help the large market vendors in expanding their consumer base, the smaller market players can sustain in the market by merging themselves with larger vendors. The new players entering the global auto-injectors market are expected to concentrate on capturing the regional market before advancing towards the larger regions. Strategic alliances, partnerships, and collaborations are also expected to be the defining strategies within the global market for auto-injectors. The global market for auto-injectors is projected to reach a value of US$2.5 bn by 2020-end from a value of US$665.0 mn in 2013. Thereby, the CAGR of the global market for auto-injectors is expected to settle at 18.60% over the period between 2014 and 2020. Based on geography, the market for auto-injectors in North America is expected to outdo all other regional markets. 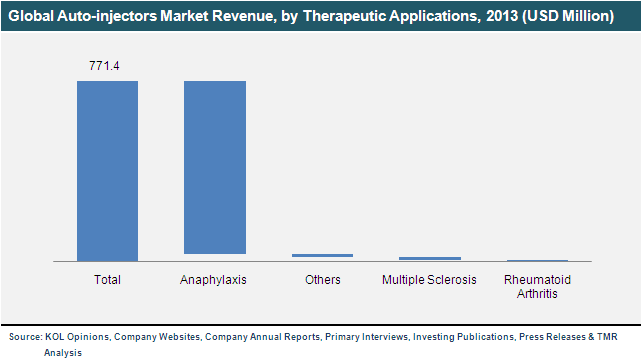 On the basis of therapeutic application, the rheumatoid arthritis segment is projected to attract the highest demand. The demand within the global market for auto-injectors has been escalating on account of the rising incidence of chronic diseases such as cancer, diabetes, pulmonary disorders, and rheumatoid arthritis. The administration of drugs for the treatment of all the aforementioned drugs is done through auto-injectors, thus, enhancing the growth prospects of the global market. Auto-injectors are easy to handle and inject, which makes it easy for individual to self-administer drugs and medications. This is also an important standpoint that has led to the growth of the global market for auto-injectors in recent times. Furthermore, the availability of auto-injectors that can help in injecting hormonal pills, insulin, and several reactive drugs into the body has also aided market growth. Despite the effectiveness of self-injectors in administering doses of medications into the body, the emergence of several cases of duplicated injectors has challenged the growth of the global market. However, the favourable medical reimbursements policies of several regional governments are expected to keep bolstering demand within the global market for self-injectors. Furthermore, intensive research and development meant to produce better-performing injectors is also expected to be a major contributor to market growth in the years to come. The availability of self-injectors that do not cause any pain to the individuals has also created commendable growth opportunities within the global market for auto-injectors. The review is based on TMR’s report titled “Auto-Injectors Market (Product Types: Prefilled and Fillable Auto-injectors; Therapeutic Applications: Anaphylaxis, Multiple Sclerosis, Rheumatoid Arthritis and Others; Manufacturing Design: Standardized and Customized Auto-injectors) - Global Industry Analysis, Size, Share, Growth, Trends and Forecast, 2014 – 2020”.